Cruising is all about options. Options to choose a cruise ship that is a floating resort with all the things a fine resort may offer, and more. Theme based restaurants, ice skating rinks, surf pools, gorgeous spas and shopping are all among the attractions offered by large cruise ships. Add in cooking classes with the ship’s chefs, dance classes and top entertainers and you can be as busy onboard as you like. The activities are endless. For some, the ship is the destination. Or, you can focus yourself on the culture of the destination. Maximize your time in ports with shore excursions to the key attractions the area has to offer. You can do this with the cruise line excursion offerings, or we can arrange smaller, more personalized tours for you at attractive prices. Do as much or as little as you wish, the choices are yours. Some of these cruise lines feature ships that are smaller, yet offer many of the attractions of larger ships. But with fewer people and a smaller size, the service is more personalized and the atmosphere more individual and upscale. 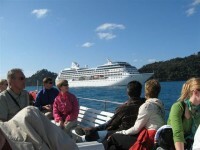 We have enjoyed cruising on all of these cruise lines’ itineraries and we understand the experience these ships offer. We will help you find the right cruise line and the right itinerary to best meet your travel wishes. 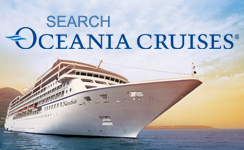 We are Gold Level Oceania Club members, signifying that we have cruised with Oceania at least ten times. Can you tell we are BIG fans? What keeps us and our clients coming back to Oceania is beautifully appointed mid-size ships, absolutely fantastic cuisine and great destinations. Regatta, Nautica, Insignia and Sirena carry 684 guests, Marina and Riviera 1250 guests. So it is easy to understand that the service is simply superb. Oceania has one of the lowest staff turnover rates in the industry and it is comforting to see so many familiar faces regardless of whether one is in New England or New Zealand. Call us, we love to talk about Oceania. On the premise that we travel to explore, to learn, to understand Viking, believes travel should be more than just a trip—it should be a doorway to cultural insight and personal enrichment. That’s why their small ship, inclusive cruise itineraries are designed to help you explore nuances of your destination: its food, culture, people and customs. Here’s some of what we feel defines the Viking Difference: After leading the river cruise industry for nearly two decades, Viking has refined the small ship sailing experience for their guests. Now, they’ve taken that same small ship, destination-focused experience to the seas and redefined ocean cruising as our elegant vessels sail through Scandinavia, the Baltic, the Mediterranean—and beyond. And because they own and operate our ships, they can deliver a seamless, consistent experience, from the banks of the Danube to Baltic shores. The Culture Curriculum, an exclusive onboard program, brings local culture to life with informative lectures on history and art; tastings of regional food and wines; and enriching Destination Performances featuring folkloric shows and musicians. Through the included and optional shore excursions, Viking provides the perfect overview of must-see cultural and historic highlights, plus delightful surprises. More than just a place to sleep, each stateroom is an open and airy sanctuary with a sweeping view of your destination. From Veranda Staterooms to the spacious two-room Explorer Suites, you’ll find a beautifully designed, streamlined Scandinavian interior, well appointed in the understated elegance and contemporary comfort for which Viking is known. Add destination focused dining, serene Scandinavian ship design and Viking has put together an award winning ocean experience. Viking was named the #1 Ocean Cruise Line by Travel + Leisure readers in its 2016 World’s Best Awards, overtaking the spot previously held by a luxury cruise line for 20 years. And, in 2016, Viking’s first oceangoing vessel, Viking Star, received three top awards in Cruise Critic’s 6th Annual Cruisers’ Choice Awards. After 40 years of cruising, Royal Caribbean has learned a thing or two about innovation at sea. They say there's only one rule: Anything is possible. And they push the limits of the imagination to give you the most innovative ships, exciting worldwide destinations and personalized service to each and every guest. With hundreds of destinations in 72 countries on 6 continents to choose from, all you have to do is pick a spot and go. While you sail, enjoy first-at-sea experiences on their innovative ships such as the North Star viewing capsule, SeaPlex (bumper cars, roller skating, and more), Ripcord by iFly®, FlowRider® surf simulator, rock-climbing walls, zip line, ice-skating rink, AquaTheater shows and Boardwalk® carousel. Our clients consistently make Royal Caribbean their mass-market cruise line of choice, and for many, the shipboard experience is what it is all about. It’s all included on Regent. Even the luxury! Regent features mid-sized ships with guest capacities of 490 to 700 and crew to guest ratios of 1:1.5. With those numbers that means there are more than one crew member to support every two guests on board. So you know the service is superb. And it’s included. Dining is whenever, wherever and with whomever you choose in their open-seating restaurants. And the food is world-class. What’s missing? Extra charges for wine, specialty restaurants and gratuities on both. They are included. Also included is round trip airfare, unlimited shore excursions, open bars, ground transfers, all gratuities and a pre-cruise luxury hotel package. And more. What isn’t included? The big bill one typically gets at the end of the cruise. We have some clients who are hooked on Regent Seven Seas regardless of the inclusion pricing and value. Take that into account and it is not hard to see that one could enjoy luxury level cruising at premium prices. Contact us to get the details on how this might work for you. Or, choose a smaller ship that goes places the larger ships cannot go. Small ship cruising provides a destination focused cruise experience and an opportunity to go wherever your vacation dreams lead you. You may choose to cruise where you can view abundant wildlife in remote locations, or perhaps snorkel and dive in waters typically accessible only by excursion boats. These cruises can provide an intimate, yacht-like experience with fewer than 100 passengers. The atmosphere is casual and focused itineraries can bring together like-minded people, e.g. wine tasting in a wine region, or regional dining. We have cruised on small ships in Alaska, Hawaii, Mexico, Central America and the Panama Canal, on rivers in North America, Europe, Asia and Africa. We are small ship enthusiasts, so if small ships are your interest, we are eager to use our knowledge and experience to assist with your travel planning. For over 40 years, Allen Marine Tours has showcased the best of Southeast Alaska on their own custom built jet boat day tours. If you have cruised Alaska on a big ship and taken a jet boat excursion, you have probably been with them. Now They are sharing their insider’s knowledge on 8, 9, 11 & 13-day cruises spotlighting scenic beauty, amazing wildlife and intriguing native culture. This is your opportunity to linger in the midst of a pod of foraging, spouting, breaching whales, or get up close to thundering tidewater glaciers and see stunning wilderness through the eyes of expert naturalists, Expedition Leaders, and Tlingit-Alaska Native interpreters. Alaskan Dream says their ships’ intimate atmosphere fosters strong bonds of friendship, many of which endure and bring you back again and again. That is certainly true for us, as we headed back to the same itinerary and same ship again this past summer. Why? Because the experience was so fantastic that we just had to do it again - and this time we brought family members with us. We have clients who are Alaska fans and have been there many times, many ways. Their verdict - the best Alaska, ever! See Viking Voices for a short summary of our great second cruise. While a small ship brings you closer to world famous highlights, and small harbors accessible to only a few, with Star Clippers the wind charts your course in the most ecologically friendly manner. Here you can help raise the sails, learn to tie knots, lie in the bowsprit net over the water, or climb the mast to the Crow's Nest. We've done these things on the Star Flyer and it is a sailing experience like no other. We are so hooked! You will be too when you experience Star Clippers. On a cruise of 140 passengers, we finally met another rookie Star Clippers guest. Everybody else were repeaters and most multiple times. Right there you know this is an experience people want to have again. And again. Star Clippers has multiple itineraries in the Mediterranean, Caribbean, and Asia on three beautiful sailing vessels. Call us to experience one. With ships ranging in passenger capacity from 296 to 540 Silversea sails to fabulous destinations all over the world. The lifestyle on board a Silversea ship is one of fewer guests, more space and features Silversea’s personalized service. This line is all about ultra-luxury, style and personal enrichment activities. We also like their commitment to preserving the health of the oceans. If you are looking for a little adventure, consider a Silversea expedition cruise. Their expedition cruise destinations include the frozen polar regions of Antarctica and the Arctic, Europe's remote northern isles, Norway's fjords and Latin America. And the ships are purpose-built for the regions, yet offer that same Silversea lifestyle. Un-Cruise Adventures are hands-on small boat explorations. With several styles to choose from: Active; Luxury; Heritage; and Charter Adventures—they give you an inviting alternative to the typical cruise. Kayaks and whales, snorkels and totems, mountains and desert, service and wine. Un-Cruise enables you to venture into some of nature’s most exciting playgrounds and historic ports for exploration, eye-to-eye wildlife encounters, and living history. We cruised the Hawaiian Islands with Un-Cruise and were thrilled with the experience. Beautiful yacht, great crew, delicious meals and terrific excursions. We snorkeled, kayaked, hiked, night snorkeled with the Manta Rays, paddled an authentic outrigger canoe, and much more, the list just goes on. Here is a typical Un-Cruise scenario: In the middle of breakfast one morning the 22 of us got into two skiffs and safely followed a pod of seven whales. We are trained and certified by Un-Cruise to expertly guide you through the Un-Cruise Adventure selection process. Call or Contact Us today to start planning your next cruise! About 10 million people in the world go on a cruise every year. 15% of Americans have been on a cruise ship at least once.